Find artworks, auction results, sale prices and pictures of Maclise Mcdonald at auctions worldwide. 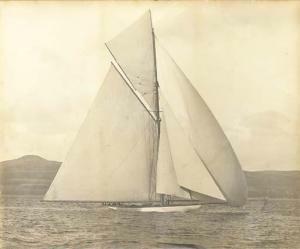 The photographs we have assembled represent a rich variety of subject matter, including luxurious yachts and Sunday dinghies, historic images like those of American (1863) and ShamrockII (1901); and a broad selection of work by the most sought after Maritime photographers, American and British, including the non pareil Morris Rosenfeld and incomparable Beken of Cowes. Frank Beken moved to the Cowes, Isle of Wight in 1888 to open a chemist's shop and sell Maritime photographs. Both enterprises succeeded. His son Frank, grandson Keith and a great-grandson Kenneth continued the tradition of success and unsupassed excellence. Their extensive files (in excess of 150,000 glass negatives) and numerous books handsomely document the history of British and Continetal yachting.